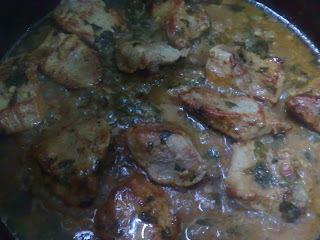 Today I was looking at recipes for this veal that I had and found this recipe and decided it was simple enough. It turned out great. Tender and delicious. I didn't have capers and I used apple juice instead of white wine. It's not everyday that I feel inspired about cooking, you know. 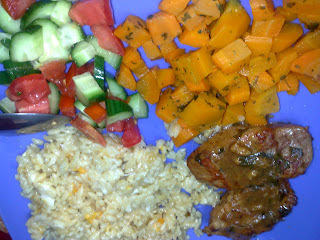 We had it with some salad, sauteed carrots and cheesy orzo. I'm not big on veal, but I may have to try that with chicken soon...looks yum! You've just answered one of the questions I've been asking myself for a great while:What to use instead of white wine in recipes that require it?Apple juice ;)! The pics look really good, btw! Jasmina, on the yea the site if you click on the ingredient it says what can be substituted. Constructive Attitude, Nope, not Egyptian food. Mom of 2 Yea it is simple, and It feels like you know what you're doing! Abid, thanks for the link. what do we call capers in arabic? I will ty this very soon. nalbanna, Thank you. I have no idea, or if they are available here. Google it. Jessy, I bet they would be good in there. Thanks.